Slovenia’s relatively high energy intensity is decreasing too slowly compared to other EU Member States. In 2008, total energy intensity increased after decreasing for six years, which represents a deviation from the set objectives. This indicator shows total energy intensity that is calculated as the ratio between the total energy consumption and gross domestic product for a calendar year. Energy consumption per unit of GDP is one of the main indicators of sustainable development that shows to what extent there is a decoupling between energy consumption and economic growth over time. The indicator decreases if GDP grows at a higher rate than energy consumption and environmental pressures decrease if energy consumption decreases. Energy intensity decreases with improvements in energy efficiency (Statistical Office of the Republic of Slovenia, 2009). It enables us to evaluate the energy consumption of the economy and its energy efficiency. It is measured in toe/million EUR 2000 (the consumed primary energy is measured in tonnes of oil equivalent and the national gross domestic product is converted into constant prices (in EUR) in the year 2000 so as to enable direct comparability among Member States). Total energy consumption is the sum of total energy consumption of different sources of energy: solid, liquid and gaseous fuels, nuclear energy, renewable energy sources and exports and imports of electricity (net import of electricity). Statistical Office of the Republic of Slovenia, 2009; Ministry of the Economy, 2009. - 20 % energy savings by 2020. Energy consumption is the largest source of environmental pressure, while on the other hand, energy is indispensable for the existence and development of humankind. One way of reducing energy consumption is to reduce energy-related activities (e.g. reducing the number of passenger kilometres travelled, reducing the requirement for heat), or by using energy in a more efficient way. In 2008, Slovenia required 256 toe of primary energy/2000-million EUR GDP. In 2007, energy intensity decreased by 6.3 % and in 2008, it increased by 2.1 %. Since 1997, an increase in energy intensity was noted only twice, i.e. in 2001 and 2008. The biggest reductions were evident in the second half of the 1990s, while the dynamics of this reduction became more moderate after the year 2000. A more considerable reduction in energy intensity was again noted in 2006 and 2007, while the trend of 2008 represents a deviation from the set objectives. 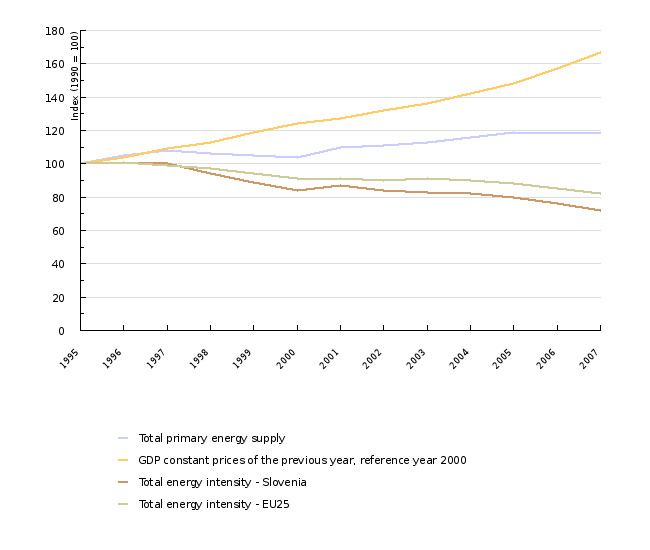 In 2007, the EU-25 needed 165 toe of primary energy/2000-million EUR GDP, which is 3.7 % less than in 2006. Slovenia therefore generated the same product with an approximately 50 % higher energy consumption that the EU-25 average. In the 1995-2007 period, energy intensity decreased by an average of 1.6 % annually and in the last seven years at an average rate of 1.4 % annually. In the last twelve years, energy intensity in Slovenia decreased at a rate of 2.7 % and in the last seven years at a rate of 2.4 %. In the last seven years, the same reduction as in the EU-25 was also evident in the EU-15 countries, while in the EU-10 countries, the average annual reduction stood at 3.0 %. In the treated period, the intensity of Slovenia’s economy came close to that of the EU-25’s, but this alignment was considerably too slow at the beginning of the third millennium. In the last two years, however it substantially improved. A comparison of energy intensity in 2007 calculated from GDP in PPS shows the intensity of the Slovenian economy being approximately 12 % higher than that of the EU-25. There are also substantial differences among individual Member States. The most energy efficient Member State, Ireland, consumes almost three times less energy for the same GDP as the least energy efficient Member State, Bulgaria. 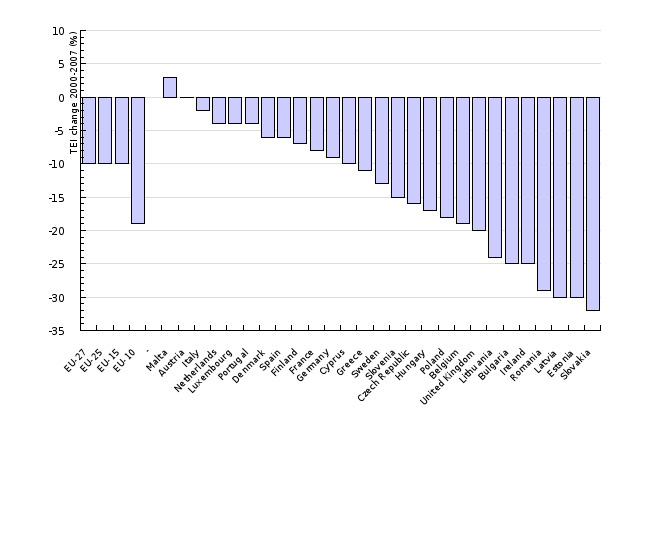 Slovenia is among the more energy wasteful Member States, while another problem lies in its reduction level being among the lower ones with regard to other energy wasteful Member States (Figure 2). Even though we used over 70 % more energy per unit of GDP than the EU in 1995 and 60 % more in the year 2000, we did not make a lot of progress compared to other EU Member States, as in these years differences in energy intensity among the EU Member States also decreased. This is why we had a higher level of energy intensity in 1995, 2000 and 2007 than all of the western European countries, while all of the eastern European countries had an even higher level of energy consumption than Slovenia. Therefore, we have not progressed in the ranking of European countries in the last twelve years. (Institute of Macroeconomic Analysis and Development, 2010). Slovenia’s high energy intensity can be correlated with a rather low GDP per capita with regard to the EU average and a high share of industry in the GDP as well as the impact of transit traffic. As regards energy consumption per capita, Slovenia is close to the EU-25 average (only slightly more than 2 % below average in 2007). A similar energy consumption is for example evident in Ireland, which however has a substantially higher GDP per capita than Slovenia and thus also a lower level of energy intensity. Among the EU Member States, Slovenia has almost the highest share of manufacturing industries, especially paper, chemical, non-metal and metal industries, i.e. activities which use an above-average amount of energy. These four industries together generated 30 % of added value generated by manufacturing industries in 2007, while the share of energy consumed by these industries was over twice as high standing at 70.5 %. The high primary energy intensity is influenced by electricity and heat production in thermal power plants with low efficiency and in the nuclear power plant, whose statistically determined efficiency stands at 33 %. The renewed increase in energy intensity in 2008 in Slovenia was the result of high energy consumption in transport, while GDP growth already slowed down due to the onset of the economic crisis. In 2008, economic growth in Slovenia declined throughout the year and was even negative in the last quarter of the year. The average for the year was 3.5 %. Primary energy consumption increased by a higher percentage, i.e. by 5.6 %. According to data provided by the Statistical Office of the Republic of Slovenia (which include only domestic transport operators), the volume of road freight transport substantially increased in the last quarter of 2008 (by 17.2 % on the interim level and by 18.4 % on an annual level). The sale of diesel fuel in Slovenia increased by as much as 23.1 % in 2008, which was also the result of this fuel being sold at a lower price than in the majority of neighbouring countries. Road freight transport therefore contributed the largest share to a renewed increase in energy intensity. The relatively high energy consumption was therefore the result of a 16.2 % or 410 ktoe increase in the consumption of petroleum products, a 10.1 % or 150 ktoe increase in the consumption of nuclear energy (a year without a regular overhaul), a 22.8 % or 64 ktoe increase in the consumption of hydroelectricity (high river capacity) and an 11.1 % or 52 ktoe increase in the consumption of biomass (an increase in the co-incineration of biomass in thermal power plants) (Institute of Macroeconomic Analysis and Development, 2010). • a new international framework agreement on energy efficiency with a view to facilitating general endeavours. Furthermore, Directive 2006/32/EC on Energy End-Use Efficiency and Energy Services that was adopted in April 2006 covers all end-use sectors, with the exception of undertakings included in the scheme for greenhouse gas emission allowance trading within the Community and to a certain extent also to aviation and maritime bunker fuels and the armed forces. The mentioned Directive requires the Member States to set the framework target of achieving 9 % energy savings (2001-2005 average) in 9 years (2008-2016) by implementing measures for energy efficiency. In order to achieve this target, each Member State has prepared its action plan for energy efficiency for the 2008-2016 period. The set direction is also being followed by one of the targets laid down in the 3x20 package adopted in March 2007, i.e. 20 % energy savings by 2020. There will also be other factors influencing the energy intensity of primary energy consumption: the technological refurbishment of the transformations sector and increase in the production of electricity from renewable energy sources and in cogeneration plants as a result of the implementation of different measures determined by the Operational Programme for Limiting Greenhouse Gas Emissions by 2012. The National Energy Efficiency Action Plan for the 2008-2016 Period that was adopted at the beginning of 2008, will enable Slovenia to achieve the final energy savings target of 9 % in nine years. The implementation of the plan is currently still not financially covered. Objectives summarised by: Resolucija o Nacionalnem energetskem programu (Resolution on the National Energy Programme, Official Gazette of the Republic of Slovenia, No. 57/04), Directive 2006/32/EC on Energy End-Use Efficiency and Energy Services and the proposal of the climate and energy package. 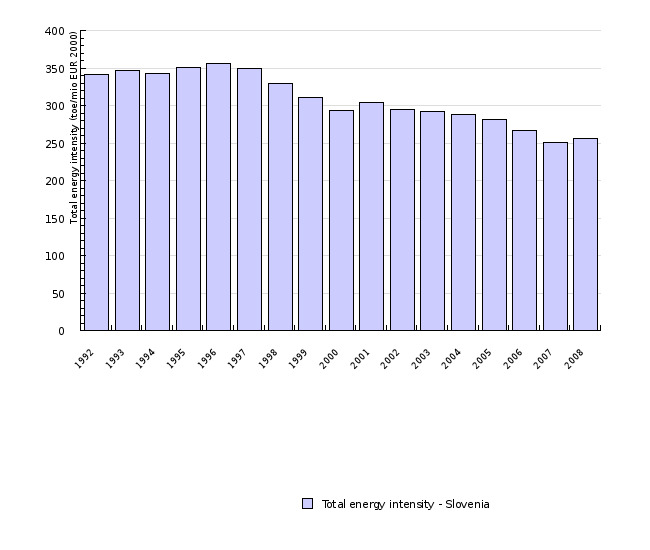 Energy supply: 1995-1999: the Jožef Stefan Institute (see EN16 – Total Energy Consumption by Fuel), following the year 2000: the Statistical Office of the Republic of Slovenia (SI-STAT > Energy Balance). 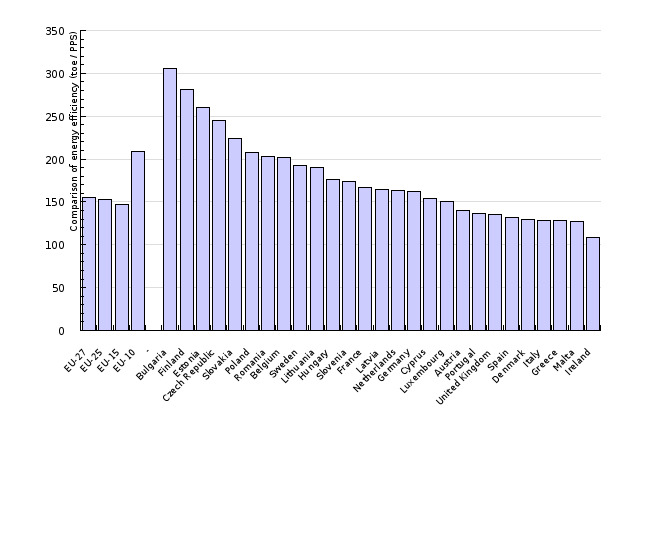 Data for the EU and Slovenia for comparison with the EU: EUROSTAT (100900 Gross inland consumption > All products). GDP: 1995-2008: the Statistical Office of the Republic of Slovenia > Constant prices in the previous year, reference year 2000, EUR 2000 exchange rate: the Bank of Slovenia. Data for the EU and Slovenia for comparison with the EU: EUROSTAT (GDP and main components – volumes > Gross domestic product at market prices > Millions of euro, chain-linked volumes, reference year 2000 (at the year 2000 exchange rates)). Data administrator: Statistical Office of the Republic of Slovenia (Mojca Suvorov, Andrej Flajs) or EUROSTAT. Methodology and frequency of data collection: Data are prepared on an annual basis. There is a difference in the methodology employed by the Slovenian Statistical Office and that employed by EUROSTAT as regards data for the energy balance, as these two institutions use different data for calorific values of individual types of fuel that are required to convert the consumption of fuel in mass units (t, Sm3) into energy units (toe). The Slovenian Statistical Office uses national data on calorific values, while EUROSTAT uses default values that are the same for the entire EU-25 region. Furthermore, there is a difference in the EURO/SIT exchange rate used by EUROSTAT and the Bank of Slovenia, which causes a difference in GDP data. Data processing methodology: The indicator is calculated as the ratio between energy supply (the item in the energy balance provided by the Statistical Office of the Republic of Slovenia) or total energy consumption and GDP in the year 2000 constant prices. The time series on gross domestic product is at constant prices of the previous year with the 2000 reference year to avoid the impact of inflation. In calculations, the exchange rate of the year 2000 is used (the Bank of Slovenia, 205.0316 SIT/EUR). For cross-country comparisons, gross domestic product in purchasing power standards (PPS) is used. INDIGENOUS PRODUCTION + IMPORTS – EXPORTS + RESERVES + INTERNATIONAL MARINE BUNKERS. Average annual rate of growth is calculated using: [(last year/base year)(1 / number of years) –1] x 100. Geographic coverage: The EU-27 countries are the EU Member States: Austria, Belgium, Bulgaria, Cyprus, the Czech Republic, Denmark, Estonia, Finland, France, Germany, Greece, Hungary, Ireland, Italy, Latvia, Lithuania, Luxembourg, Malta, the Netherlands, Poland, Portugal, Romania, Slovakia, Slovenia, Spain, Sweden, the United Kingdom. The EU-25 countries are the EU Member States excluding Bulgaria and Romania. The EU-15 are the EU Member States prior to enlargement (Austria, Belgium, Denmark, Finland, France, Germany, Greece, Ireland, Italy, Luxemburg, the Netherlands, Portugal, Spain, Sweden and the United Kingdom). The EU-10 countries are the Member States that acceded to the EU in 2004 (Cyprus, the Czech Republic, Estonia, Hungary, Latvia, Lithuania, Malta, Poland, Slovakia and Slovenia). Reliability of the indicator (archival data): Energy intensity calculated using GDP in constant prices is appropriate for time comparisons of energy intensity, while energy intensity calculated using GDP in PPS is more appropriate for cross-country comparisons. PPS are currency conversion rates that convert GDP data to a common currency and equalise the purchasing power of different currencies. - Institute of Macroeconomic Analysis and Development, 2010. Development Report 2010.